Preface. Introduction. On the origins of behavior structure (A.C. Catania). Functional and Equivalence Classes in Animals. 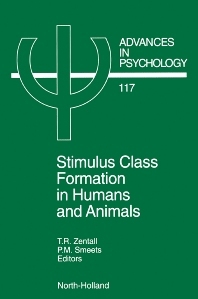 An analysis of stimulus class formation in animals (T.R. Zentall). Stimulus generalization and hierarchical structure in categorization by animals (W.A. Roberts). Acquired equivalences and mediated generalization in pigeon's matching-to-sample (P.J. Urcuioli). Categorical class formation by an African grey parrot (Psittacus erithacus) (I.M. Pepperberg). Functional and Equivalence Classes in Humans. Derived stimulus control: Are there differences among procedures and processes (K.J. Saunders et al.). Mediating associations, essentialism, and nonsimilarity-based categorization (S.L. Astley, E.A. Wasserman). Equivalence Classes: Stimulus Control Variables. Stimulus classes and the untrained acquisition of stimulus functions (M.J. Dougher). New procedures for establishing emergent matching performances in children and adults: Implications for stimulus equivalence (D. Barnes et al.). Stimulus equivalence: A class of correlations or a correlation of classes (C. Pilgrim, M. Galizio). Implications of a stimulus control topography analysis for emergent behavior and stimulus classes (W.V. Dube, W.J. McIlvane). Equivalence Classes: Verbal Behavior. Naming and the formation of stimulus classes (R. Stromer, H. MacKay). Controlling factors in conditional discriminations and tests of equivalence (J.C. de Rose). Stimulus classes and stimulus relations: Arbitrary applicable relational responding as an operant (S.C. Hayes et al.). Author Index. Subject Index. Stimulus class formation has been studied independently by two groups of researchers. One group has come out of a learning theory approach, while the second has developed out of a behavior analytic tradition. The purpose of the present volume is to further establish the ties between these two research areas while allowing for differences in approach to the questions asked. The book is loosely organized around four themes. The first two sections deal with what constitutes functional and equivalence classes in animals and humans. In the third section, the authors attempt to identify stimulus control variables that contribute to the formation of equivalences classes. The last section deals with the complex issue of the role of verbal behavior in equivalence classes. The goal of the book is to provide the reader with a better understanding of the current state of research and theory in stimulus class formation. It is also hoped that it will stimulate research into how and under what conditions, stimulus classes can form.